Anyone who has taken a Pranic Healing course will have heard these words. Follow simple instructions. This captures perfectly one of the things I love about Pranic Healing and Arhatic Yoga – on the winding, long, sometimes thorny path that spiritual development can be, we are spared a lot of trouble thanks to the people who went before, made the mistakes, tried out a lot of various ways and can now help us make at least fewer mistakes. We are given instructions for how to help ourselves and the people around us to be more healthy, we are given tools for relationship improvement, for material abundance, for protection and empowerment. But still there are people who attend the workshops, yet keep having the same problems that they had years before. Of course, sometimes the law of karma is at play, and then things become more complicated. But sometimes it simply of case of not doing what we know we should: follow simple instructions. As an experiment, try scanning the basic chakras of the people who, year after year, say “I really should eat healthier/exercise more/meditate more/do more self-healing/stick to my arhatic routine/you name it. You’ll notice they are most likely very weak. Mine is a prime example of this at times, and those are the times when I find myself not getting anything done. If you’ve done even the Basic Pranic Healing workshop you’ll know that the solution to this is to cleanse and energise the basic chakra. The basic chakra is the centre for dynamic activities, the chakra of action (“The Chakras and their Functions”, Master Choa Kok Sui, 2009, p. 35). But here’s what I’ve run into – in order to be more productive I need to strengthen my basic chakra. In order to do that I need to actually get my salt water bucket and do some healing. But with a weak basic chakra I’m less likely to do that and more likely to watch Big Bang Theory for three hours straight. This makes me feel like I’m wasting the gift that it Pranic Healing. Of course, watching this video will not remove all procrastination, but it’s another tool on the toolbox. The way I see it, in taking on a project like my own procrastination, it’s a step-by-step process, where I can use many different tools, one after another, and they’ll all support each other. I can watch the video and be inspired by it, then use that inspiration to energise my basic chakra, then use that energy to start that list that David is talking about, then use the sense of control to be calm enough to do a meditation, then use that energy to do a couple of things off that list, which will in turn strengthen my basic chakra. And the plan is to keep going like this. With that flow going I will more likely do the other things I’ve been “shoulding” or wanting for so long – exercise, removing obstructing thought forms, reading The Lord of the Rings, doing self healing so I wouldn’t need my glasses anymore, really progressing on my PhD, writing in this blog more often, doing kriyashakti for the right partner to have a family with and so on and so forth. Often I see people who experience Twin Hearts Meditation (also called Planetary Peace Meditation) for the first time, and are ecstatic about it, they immediately feel the love and elation and power. Then there are those people, like me, whose first reaction is ‘that was nice, I feel sort of relaxed although my mind was racing the whole time’. If I hadn’t seen the effects regular practice of Twin Hearts has, I probably wouldn’t have continued at all. In fact, I almost didn’t. My meditation was sporadic, every time I went to a group meditation I made a decision to start meditating regularly, and a month or so later I realised I hadn’t. It was exactly like my plans to start exercising more. Every time I for some reason manage to get my running shoes on, I promise myself I’ll do it more often, and then I didn’t. Yet. Then the Finnish Pranic Healers and Arhatic Yogis started doing a weekly meditations via Skype, and it was a lot easier to stay regular. A bit like joining an exercise class, you’re more motivated to go because the hassle of letting people know why you’re not coming makes it easier to just go 🙂 Especially as all you have to do is turn on Skype! First benefit: the nice feeling of being in a group. 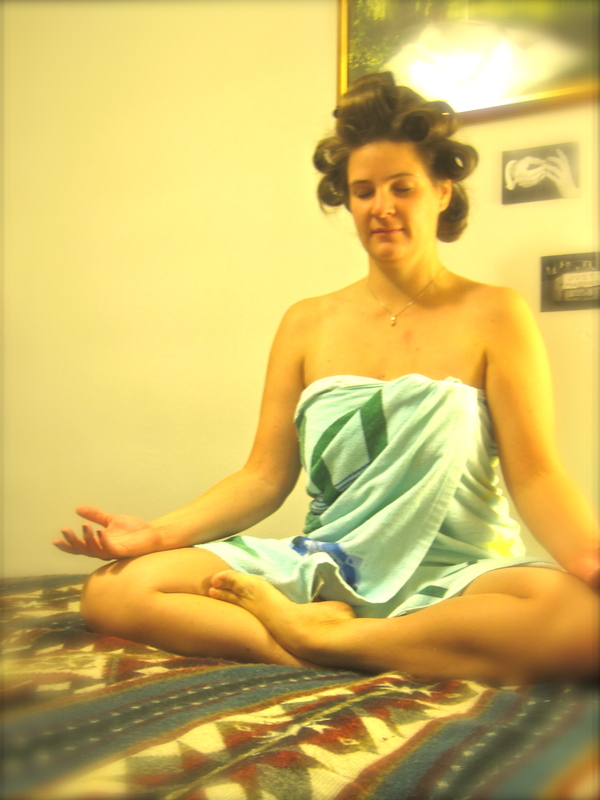 Second benefit: doing meditations in between the Skype meditations got a lot easier. Close door, sit down, close eyes, press play. And remember physical exercises before and after the meditation, especially if you spend your days sitting down at work etc. Just move or rotate all parts of your body (eyes, neck, arms, torso/spine, hips, elbows, wrists, fingers, knees, ankles) 12 times each (in both directions when rotating) and do semi-squats 50 times. This is to prevent the energy from getting stuck. Don’t try to avoid this step, you might thing you don’t need it because you’ve done other kinds of meditation before, but it’s not worth the risk of energy blockages, trust me. But again, it’s not always an instant result (although I have seen that happen too, for some people. Rare though) Like with any exercise, it’s tough at first, you get frustrated when you don’t see the results you want, but once you get into it you don’t really know how you managed without it before. So a small warning – if you do decide to take up this kind of powerful meditation as a regular practice, be prepared to make it a lifestyle, as it won’t stay a ‘once in a while’ thing once you start getting the benefits of it. And it’s brilliant! 1. Persons below 16 years old. 5. Heavy meat eaters (particularly pork). 6. Persons with excessive alcohol consumption or use of addictive and hallucinogenic drugs. These days spiritual people rarely retire from society and spend their time meditating in remote mountains. Today’s spiritual people often live in cities, surrounded by people, active in society, putting themselves ‘out there’ to promote awareness and help people understand the ‘feelings’ they might not understand. The same goes for anyone openly involved in and promoting alternative health. This also means we are often under attack from those who find alternative health and spirituality bad or offensive or even dangerous. And thoughts and speech are very real, they are made up of energy and they affect the person they are targeted at, not just on an emotional level, but can also cause problems on a physical level in the long term. People who actively speaks up about these issues, especially those who take the step ‘out of the spiritual closet’ and openly discuss these things with people who aren’t always positive about it, are often faced with extremely harsh comments, negative speech and even accusations, name calling and ridicule. Sometimes when people get more sensitive, the whirlwind of energies around them can become very overwhelming, you feel, see and hear things that all demand your attentions, and it can be very tiring. Luckily we have the tools for protecting ourselves from such intentional or unintentional attacks! I can’t count the times I’ve used the techniques I learned from the MCKS Psychic Self Defense workshop and book to keep myself protected from negativity, intentional or, more often, unintentional. There are other psychic self defines methods and books too, but these are the ones I have found most useful. Working in a restaurant/bar for several summers I’ve been very grateful for being able to protect myself from the emotional outbursts that may happen there. And even when nothing seriously unpleasant happened, I felt less tired, less annoyed and found it easier to leave work behind when I went home! When talking to friends and strangers about Pranic Healing, about spirituality, I’m also incredibly grateful to have the tools to keep me calm and happy so that I can stay as clear minded and loving as possible in what I say. Knowing what my thoughts and what I say can do to other people, both positive and negative, I try my hardest to make sure I keep the positives outweighing the negatives. Keeping myself shielded from external unnecessary and harmful thoughts and feelings helps me keep my cool more effectively and gives me more time to focus on dealing with my own character building. This does not mean I’m oblivious to what’s going on around me. The best way I can describe the feeling is like watching a favourite film you’ve seen several times – you still get slightly emotionally engaged with the film, you feel the ups and downs of the characters, but the ‘bad’ things don’t drag you down, you just sort of observe yourself feeling these things. 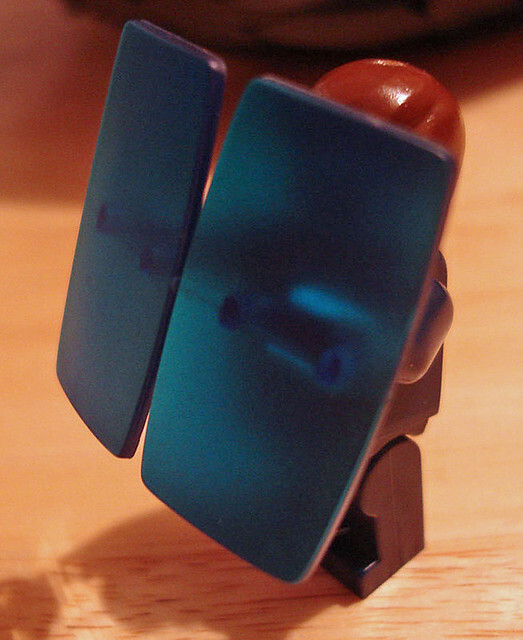 This is the effects I feel when wearing energy shields or other forms of energy protection. And these are not complicated things we can do, they start from something as simple as discreetly crossing your arms and/or legs, which closes off your aura and protects you from the thought forms coming from other people or the surroundings. Other techniques require basic knowledge of Pranic Healing, and are incredibly effective in protecting us from simple things like the tiredness and tension of fellow travellers during the morning commute to defending us against very powerful thought forms that affect whole countries and societies. Another simple thing to do is just projecting love and kindness towards anyone who is being negative towards you, whether it be as an intentional attack, or just their own emotions spilling over on you. This helps neutralise the negative emotions and helps defuse the situation easier. NOTE: this of course while still maintaining your own physical safety, walking away from dangerous situations, getting help when needed etc. This is very important. Creating your own space is important for many things, and meditation/spiritual practice is one of the things where it can make a world of difference. Of course it’s not essential, and a good meditation can bring you away from any uncomfortable setting if you can tune in properly. But for those times when tuning in is a bit difficult and the right mindset is proving elusive, being able to create the right setting can smooth things along very nicely indeed. Having been a student for several years, and moving around a lot after that too, it’s been difficult for me to be able to create a permanent meditation/spiritual practice/mindfulness space in my home. Often the bedroom is the only available space that is private in a shared flat, and often that bedroom is not very big. While dreaming about the day when I can have a whole room dedicated just for my spiritual practice, I’ve been finding creative solutions in my quest for that something that will help me find the peace of mind needed for a really good meditation. My altar/centre of calmness/decorative candle stand/miniature bookshelf/photo display-bedside table. This picture is of my current bedside table/bookshelf doubling as a place for candles and pictures. It’s not much, but it does the trick. If I’m feeling frazzled and finding it hard to focus on my inner stillness, and the presence of my favourite picture of my teacher isn’t enough to shut down the noise in my head, then I light the candles, turn off all other lights, sit myself down on the bed and drape my meditation scarf over my head so it shuts out all other visual stimuli except for the scene of candles and icons. Nine times out of ten this helps me find my inner peace and be able to enjoy meditation more, whether it is Arhatic meditations or the joyful simplicity/complexity of Twin Hearts Meditation (if you haven’t tried Twin Hearts Meditation, you can find a short audio version of it here, see if it’s to your liking). Being on the spiritual path in this modern day and age is both a challenge and a blessing. 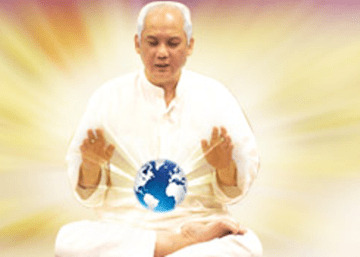 On the one hand, with the internet and the ease of travelling to different places, the availability of spiritual teachings and the possibilities of connecting with teachers are bountiful compared to a hundred years ago. But unless we want to hide away in the mountains somewhere and live like hermits, we have to learn to balance the spiritual practice with the buzz of everyday life. And everyday life can be very loud. I used to feel that if I let myself be distracted by the hustle and bustle of material life enough to be more tempted by watching TV than by meditating, then I wasn’t really worthy of the live and blessings anyway. And while this in some ways is true (truth comes to those who seek it), sometimes we need to trick ourselves into discipline. The same way that effectivity-self-help books tell us to create routines at work to get into a productive mood (have a cup of coffee when getting to the office, always sitting down in the same chair, opening the computer/documents in the same order etc etc), the same way we can use routine and audio-visual stimuli to help us get into the inner calmness mode. If we are coming home from being out in a busy city, or from watching TV or talking to friends, it is very difficult to just plop down in lotus position, close our eyes and find inner stillness. It might not even be that attractive, if what you’ve been doing before was enjoyable. 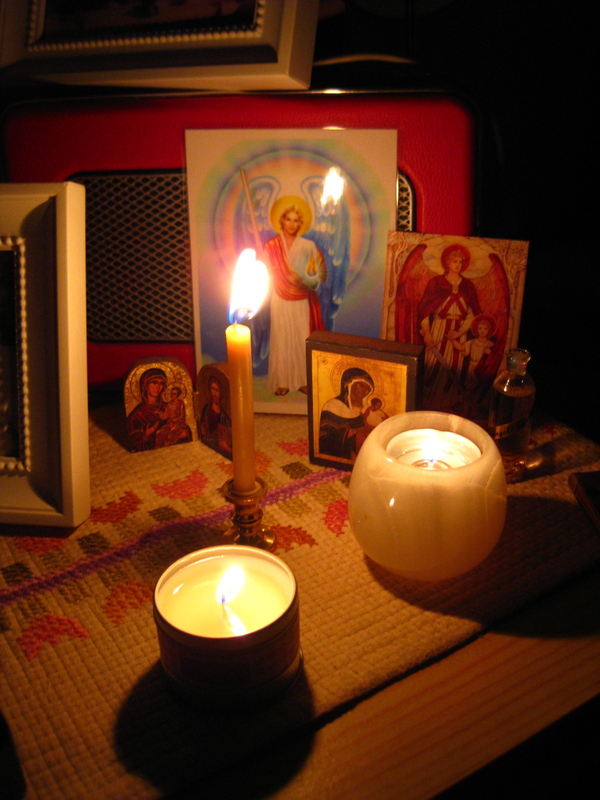 In this situation it is much more attractive to do something active, something material: light a few candles, maybe start playing some mantras, light some incense, while still letting yourself be in that active, material mode. This is a way of tricking our minds, emotions and bodies into this new mode of being, and as proved by advertising everywhere, we humans are pretty easily convinced when put in the right mood. After a few minutes in this setting, it is much much easier to let go of the frenzy of the day and enjoy the stillness. Pranic Healers know that it’s better to shower before meditating than after, to avoid washing away all the goody good good energies we get. But not only that, it’s also nice to meditate RIGHT after a shower, before adding all the everyday stuff of clothes and thoughts on ourselves. Beauty meditation – time management! Greetings from a recovering procrastinator! Here’s a somewhat less serious post, although it can be seen as a serious issue when thought about in context. While this issue is not exactly Pranic Healing per se, it is very much related to something that the effectiveness of all the techniques we learn hinges on. I’m talking about the issue of how to do all those things we know we should do but somehow find ourselves not doing. Eating healthy, exercising regularly, meditating regularly, doing self healing regularly… They key here seems to be the word ‘regularly’. It is true that most of us are very good at doing these things on occasion. Usually this occasion is coupled up with some big event that inspires us to change our lives and do better. And most of the time this inspiration last anything from a day to a few weeks. Looking back at myself for the past years, I found myself having done exactly that a great deal of times. And then I thought of the times that resolution has actually yielded results. The difference between the times it works and the times it doesn’t seems to be the amount of involvement of other people in the decision making moment, and the continued participation of those people in the process of doing *insert exercise/meditation/self healing/etc*. The most effective thing so far – apart from actually signing up for group meditations and healing evenings, which make you go because you’ve already paid for it – has been an excel sheet I created, in which I write down every time I’ve done my exercises. 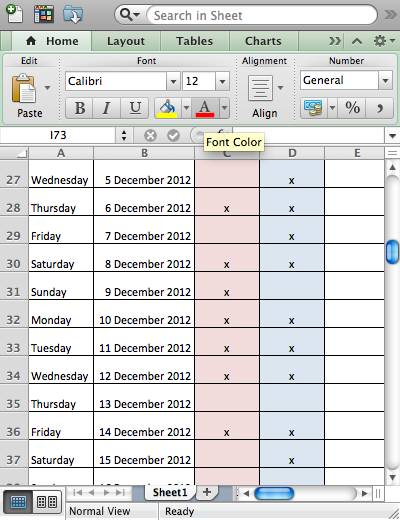 I created a calendar in excel, and a column for the different things I wanted to keep doing. Then I shared the document on google docs. With my mother. And she started marking down the days she had done the things she wanted to keep doing. And now it acts as inspiration because every time I get up and do my exercises I get to reward myself with putting a little ‘x’ in my column! And the best part is, looking back at the calendar and feeling good about all the days I’ve done it! Without some visual representation, it can easily feel like all the times you did it didn’t matter, they just disappear. This way, they spur me on every time I look at them! And another point – START SMALL! Trying to do everything you should is only going to make you stop because other things come in the way. I started off with just one simple exercise which takes about 7 minutes to complete. Now I’m up to roughly 15 minutes of things, a nice mix of self healing techniques (and some sit ups, spring is coming even if it’s just January :D). And sometimes I find myself inspired and keep going for an hour, but only because I get myself out of bed and to the salt water bucket by allowing myself to do the minimum if that’s all I feel like! The second and last day of HarmoniExpo is now over, and it was a happy, if a bit tired, group of Pranic Healers who enjoyed a celebratory meal afterwards. The second day of the expo was as wonderful and filled with people as the first one, many eager visitors asking questions and commenting on their own experiences with the scanning and the treatments. Many people were very interested in learning about scanning and feeling energy themselves, and we continued to scan the energies of the hands, and the flowers. Kari teaching the basics of scanning to two visitors. In the stall next to us they did aura photography, and some of the healers in our group decided to take ‘before and after’ pictures of themselves (which I will add here if I have the chance). The results were brilliant, on many levels – in both cases the energies and the aura became brighter, bigger and more centred! Big yay for co-operation between methods! As we had treatments happening almost throughout the day, people would often stop and ask about what ‘all this waving’ is about, why we have a box of water in the stall and whether one needs to be born with this gift 🙂 SOme visitors who received treatment had very strong reactions – one woman came back the next day to tell about how her experience of the cleansing effect had continued even after the treatment was finished! As yesterday, we also had time to do some healing for each other in between doing healing for visitors, and we got to both do ‘maintenance healing’ on each other so that we stayed energised and effective for the visitors. Ali also wanted to see if it feels different to have healing done with crystals or without. Fanny cleansing the back heart and back solar plexus chakras for Ali, trying out the difference between healing with crystals and healing without them. We also did ‘double healing’ to really test our powers – one healer treating the back and the other treating the front! Luxury treatment! Ali and Fanny doubling up for doing some scanning and cleansing exercises on Shilpa. Working at the expos is a wonderful opportunity to really have an intense pranic healing practice, and talking about the teachings and practices makes them even clearer to oneself! And spending two days with an amazing group of pranic healers like this gives one a brilliant opportunity for practice on people who can give immediate feedback (both colleagues and visitors) and help us refine our healing skills even more! It is also one of the nicest ways to do service! Now the expo is done and dusted for this time, time to take these experiences and start preparing for the next expo in Helsinki in February! 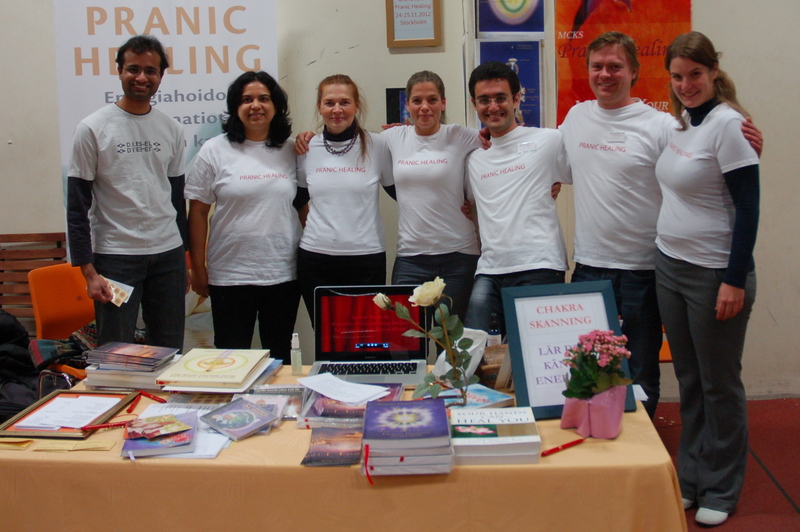 The Happy group from today’s expo – The Finnish/Swedish Pranic Healers! 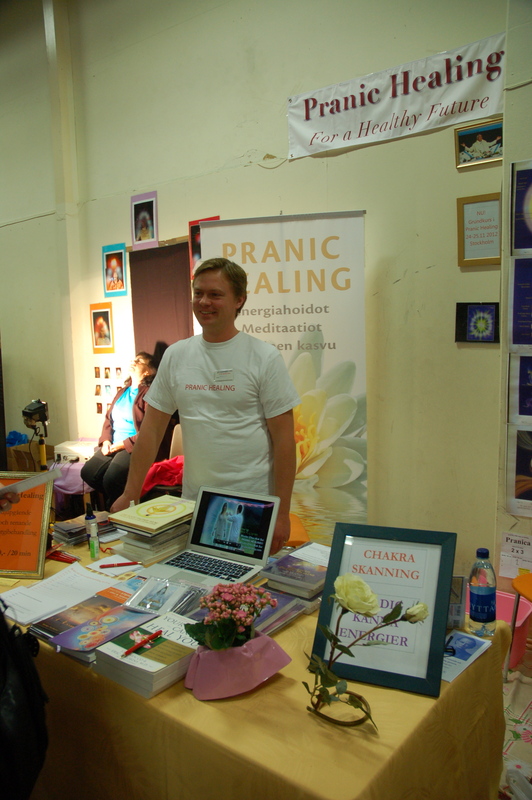 Today was day one of HarmoniExpo, the largest expo for alternative therapies in Sweden. 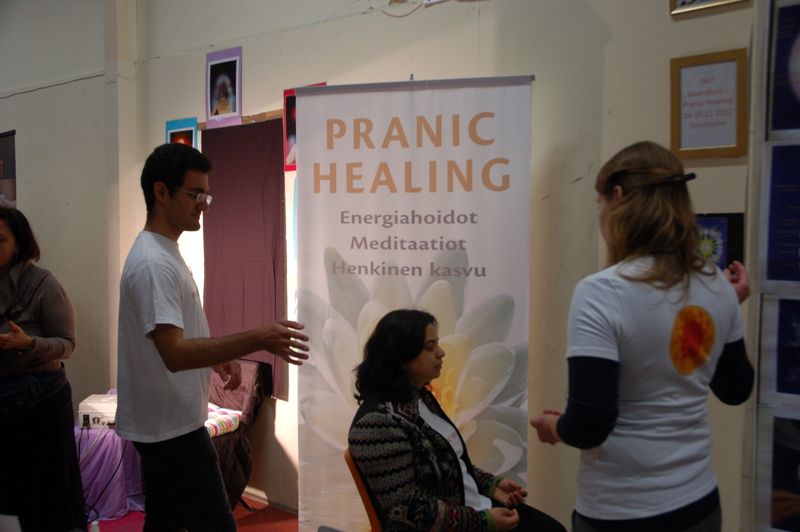 Pranic Healing Finland and Sweden got together to bring Pranic Healing to the expo, and I arrived from Finland on Saturday mid-day to find a busy stall, lots of healing being done, and people asking questions and getting answers! Ali, the organiser in Sweden, and Kari and Katja from Finland had already set up the night before, and the stall was filled with books, FOL-TOL stickers, lavender-alcohol spray bottles and informative posters. 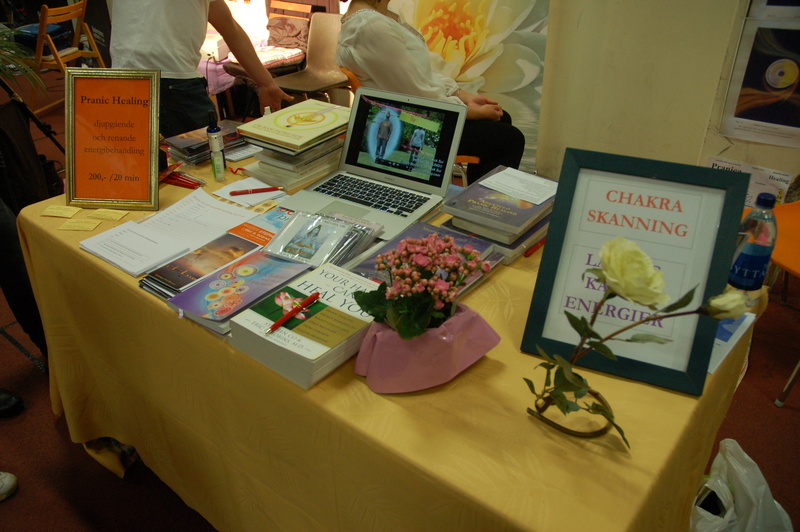 The Pranic Healing table, with informative video playing, fascinating books and leaflets, and real and fake flowers for scanning exercises. 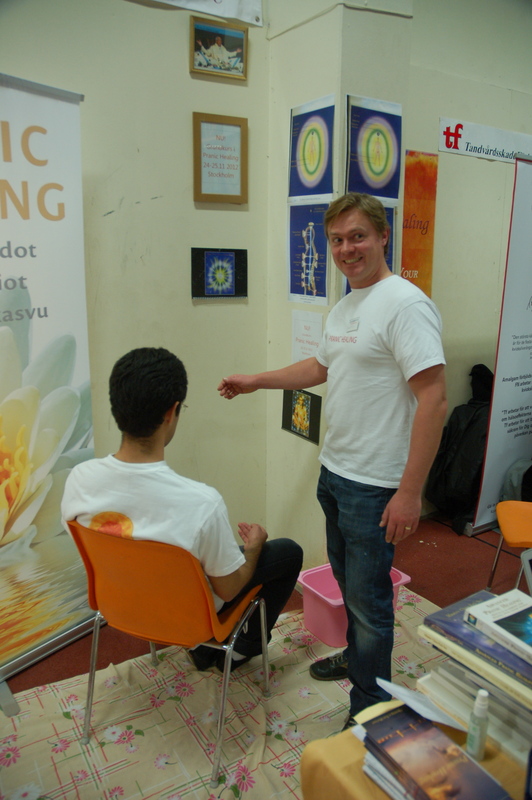 Throughout the day we talked to people about Pranic Healing, answered many interesting questions and did some simple scanning exercises to show people how everyone can feel the energy of their hands, and of other objects like flowers. 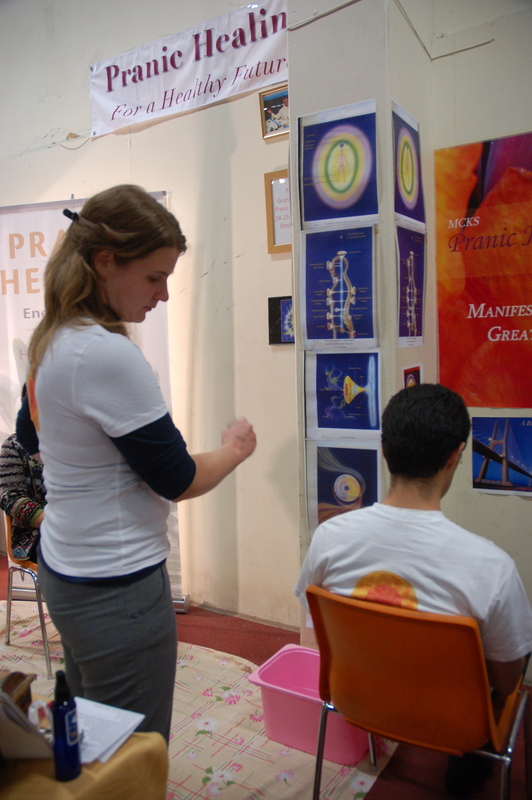 As the visitors to an expo like this often have some information about energies or other kinds of treatment, we made good use of the images on the walls showing the locations of the chakras and the energy bodies. We also did some chakral profiling for people, to demonstrate how we do scanning and what kind of information we can gather from the scanning, and how that information helps in making the healing more efficient. 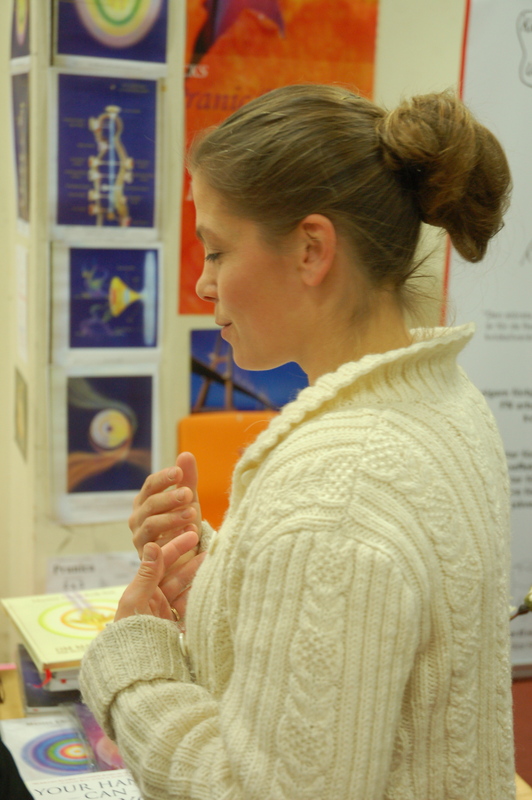 Katja explains about chakras, here talking about the heart chakra. Kari and the Pranic Healing table. At the Pranic Healing stall we had visitors from many parts of the world, and even people who had done Pranic Healing before but who had, for some reason or other, not done any PH for a long time. There were many happy faces when we told them there is an increasing amount of Pranic Healing activities and Twin Hearts Meditations going on in Stockholm now! And a very happy Ali too! In the quieter moments we did healing for each other. 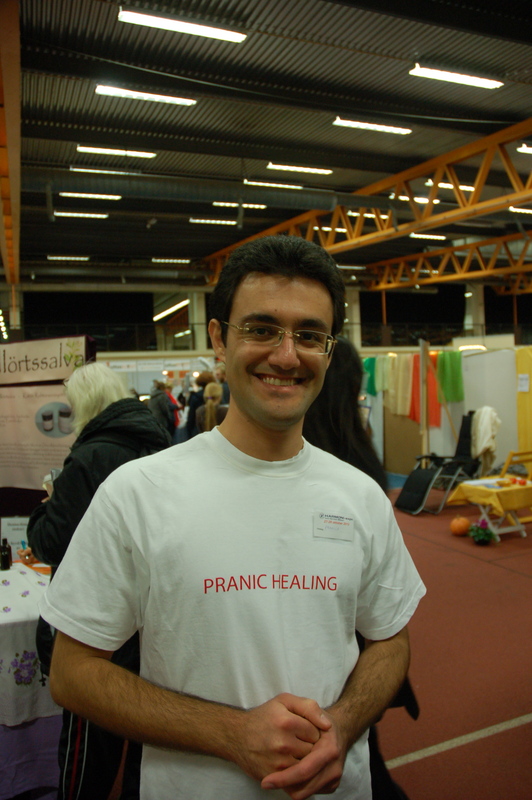 A very excited Pranic Healer! About an hour before the expo closed we suddenly realised we had not eaten much for lunch and that we were all getting rather hungry. Being a busy and excited with the healing and talking meant we had not noticed the time flying! However, eventually the physical body required its physical sustenance, which came in the form of absolutely delicious Indian food made by another Pranic Healer. A very good ending to a very good day, and a very good preparation for another equally good day tomorrow! They say being ‘too busy’ is a symptom, not an achievement, which is how many people seem to feel these days (me included, I have to admit). ‘I would love to but I’m too busy’ is a common excuse for a lot of things, it even tops the other favourite ‘I can’t afford it’. And yes, there is such a thing as having a lot of things to do, but in the end it is all down to prioritising. And yes, we should all try to calm down and get to a state of zen where we don’t feel busy, so we’d be able to do that prioritising. All in an ideal world. But while working on that, through Twin Hearts Meditation, self-healing, character building etc, we still have to figure out how to fit all these things into our busy schedule. I have noticed that trying to do a huuuge self-healing project never works, because ‘you never have time for it’. So, baby steps. One thing at a time. I have put my healing crystals to good use, and integrated my daily self-healing into my other daily routines. Morning and evening, when I go to the bathroom to brush my teeth, I programme my seven small extractor crystals to cleanse a selection of chakras/areas. They do their thing while I brush my teeth etc, and when I’m done I remove them, energise the chakras and I’m done! This also works while cooking etc, but I find that tooth brushing, or shower, works best, as it’s already cleaning, and as I keep the crystals in the bathroom with the salt, it’s the logical place – no moving of tools required!